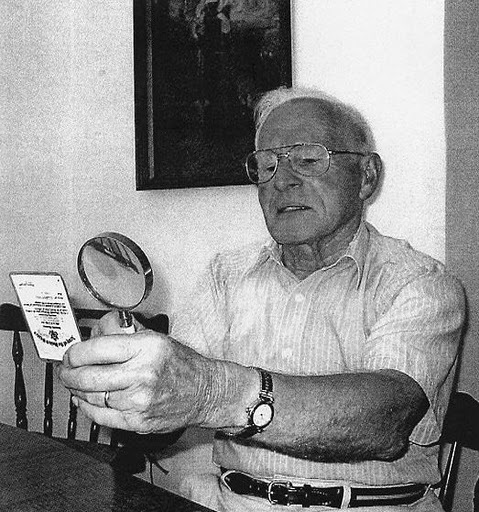 Five days after Carl Cooley of Grove City, Fla. graduated from Fremont High School in Fremont, Ohio, on June 2, 1943, he took his physical and officially became a private in the United States Army. “They were looking for cannon fodder,” the 81-year-old local man said with a grin 63 years later. Although he didn’t know it, Cooley would become a “foot slogger” in the famed “Yankee Division,” the 26th Infantry Division, New England National Guard. The division has seen action in this country’ s wars since before the American Revolution, in the War of 1812, the Civil War, the Spanish American War, World War I and right down to when Pvt. Cooley stepped ashore at Cherbourg, France on Sept. 2, 1944. The 26th Division went to the front line during the first week of October in the hills and forest between Nancy, France and the German border. It relieved Gen. George Patton’s 4th Armored Division, which spearheaded his drive across France. “The 4th Armored moved out that night and we took over their foxholes. We were told we had to hold the line. We couldn’t get out of our foxholes during the daytime,” Cooley said. “Then we started our attack. A colored tank battalion from Fort Hood, Texas, moved up on the line with us. It was their first combat and our first combat, too,” he said. “We were somewhere between Nancy and Metz when we hit this French town. I can’t tell you its name, but it was held by the Germans. “I was first scout, so I was out in front. I looked down this street to see what I could see, and all of a sudden I was sitting on my can,” he said. “A German sniper put a bullet between my helmet and my helmet liner. They were crack shots. “Sgt. Stanley was right behind me when the sniper shot at me. Moments later the sergeant spotted the enemy sniper in a nearby bell tower. He fired at him with his M-1 rifle. By sundown the black tankers, with the help of soldiers from the 26th Division, took the town away from the Germans. Cooley said his company lost a couple of men, and a few more were wounded. The tank unit lost three tanks in the assault. Patton’s 3rd Army, including Pvt. 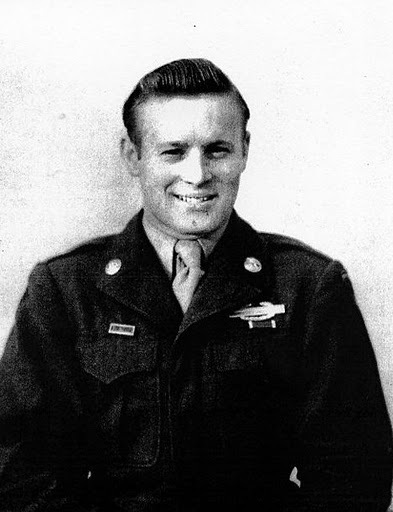 Carl Cooley, continued to move ever closer to the Siegfried Line along Germany’ s western border, which was a few miles away. Enemy forces were holding a farmhouse with an 88 artillery piece and a tank on a nearby hill. Cooley estimated the Germans must have had a company of infantry dug in around the farmhouse. The 26th Division was facing the well-seasoned 11th Panzer Division that had seen action throughout Europe. The German unit was known as “The Ghost Division” because of its ability to materialize anywhere along the Western Front during the war. The 3rd Army’s big offensive, in which the Yankee Division took part against fortified German positions, began on Nov. 8, 1944. “I remember our C.O. took a rifle grenade and fired it at the German tank on the hill. He dropped the grenade right down the tank’s open hatch,” Cooley said. “It must have been a lucky shot. I could hear the ammunition in that tank exploding the rest of the day. Before the fighting was over that day, Cooley said his company captured at least 100 German soldiers. They were marched to the rear. Their war was over. Ten days into the 3rd Army’s offensive during the Lorraine Campaign, the 26th Division infiltrated a wooded area to clear it of enemy soldiers and fortifications. Company K, Cooley’ s company, took it on the chin in the forest. Eventually, American P-47 “Thunderbolt” fighter planes knocked out the Germans’ artillery. 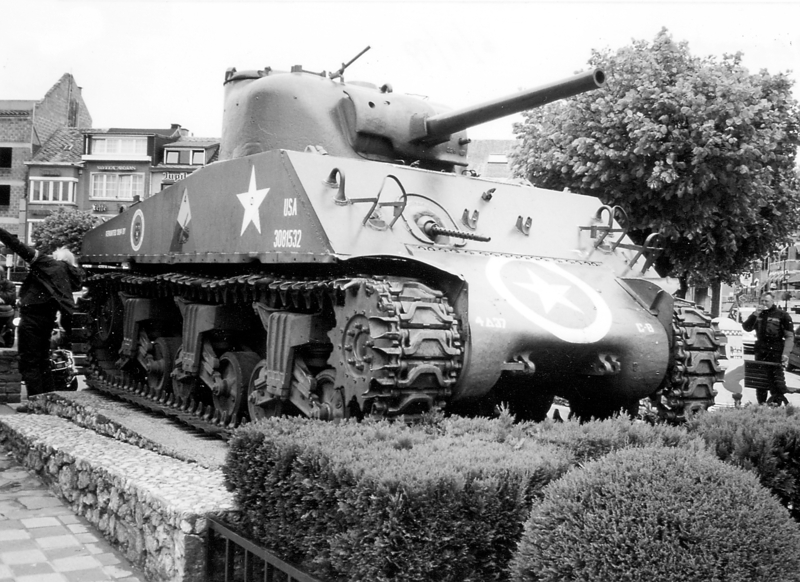 This Sherman tank sits in the square at Bastogne, France in recognition of Gen. George S. Patton’s 3rd Army that broke the German offensive at Bastogne just before Christmas 1944 during the Battle of the Bulge. Note the 4th Armored Division’s triangular insignia on the side of the tank that led the way into the village to free the American 101st Airborne Division surrounded by the Germans. “I was wounded in the knee. Me and four or five other guys were wounded about 9 a.m.,” he said. “Our unit left all their wounded behind with their rifles and moved on. They gave me a .30-caliber machine gun. Cooley underwent surgery at an Army field hospital. He spent the next 116 days recovering from his war wounds. For the final few weeks, before V-E Day (Victory in Europe), he was given light duty in England. In the meantime, the men of the 26th Division went on to play a major part in the rescue of the 101st Airborne Division at Bastogne, Belgium during the “Battle of the Bulge.” From there the division fought its way through the Siegfried Line and into the German heartland by the end of the war. On May 7, 1945, Lt. Gen. Edgar Friherr Treusch Von Buttlar-Brandenfeld, commander of the 11th Panzer Division, that had faced the “green” 26th Division in France more than six months earlier, surrendered to Maj. Gen . Stanley Reinhart, commander of the Yankee Division . “I am honored to surrender to a division famous throughout Germany,” the German general observed. This story first appeared in the Charlotte Sun newspaper on Sunday, May 28, 2006 and is republished with permission.